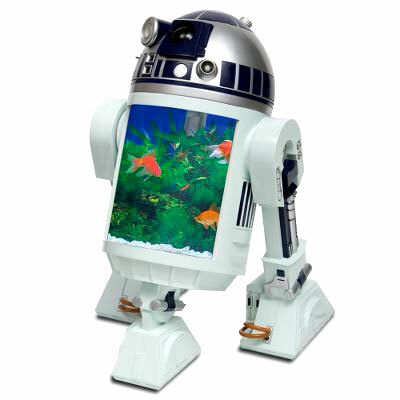 I wonder what the real R2-D2 would think about carrying a 3/4 gallon aquarium tank in his belly. 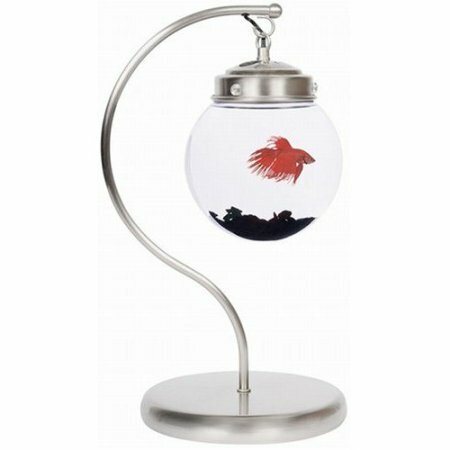 It looks good for small fish, and he even has a radar eye that doubles as a periscope into the tank so you can watch the fish when they come up to eat. The dome has a removable feeding door. Tank lights are LED and randomly morph from red to blue to green. Scenery is strictly Star Wars, of course. 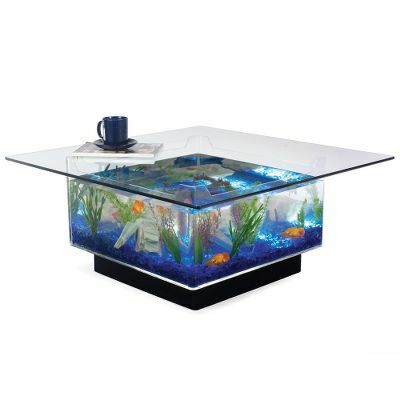 These glass table top aquariums are lovely. Do the fish like the coffee cups and magazines sitting above them? Who knows? But they do get a 360 degree round view of their external environment and either 15 or 25 gallons to swim around in, depending on which table you buy. 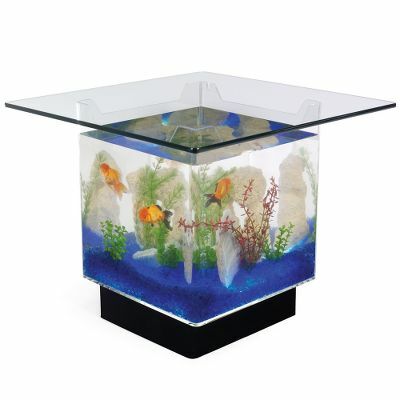 The aquarium rests on a black acrylic base and is surrounded by clear acrylic. The two-stage submersible filter pump, blue glass gravel, decorative plants and lights are all included with the tables. The tops are very sturdy 1/4 inch beveled tempered glass. The 15 Gallon Aquarium End Table has a 24" top. The 25 Gallon Aquarium Coffee Table has a 36" top. 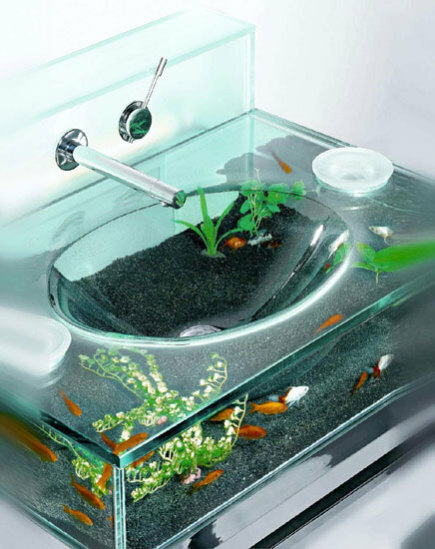 How wonderfully distracting is this sink? 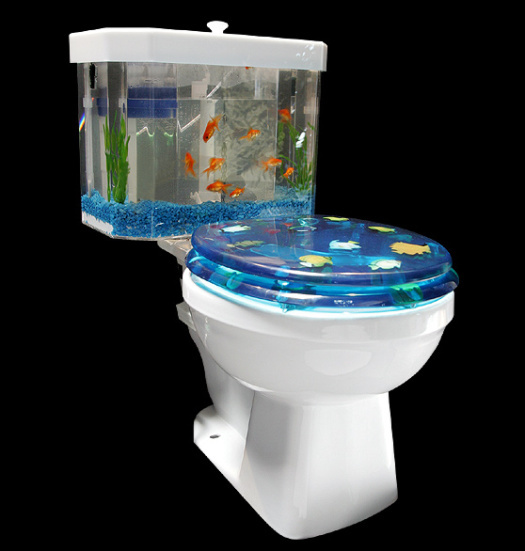 The airtight aquarium is cleverly accessed through the cup hole and soap dish for cleaning. The sand bed and lights are included, as is a power head to ensure water circulation, oxygenation and filtration. aquariums, Midwest Tropical has some really striking and elegant options and they are available on Amazon here.